Although most of the Ridge’s better read have already been made aware by bloggers here and there that there’s a new boat in town, I, alas, was in Nashville for the maiden voyage. Thus yesterday, RealtorChick allowed me the honor of being the first to actually ski behind the beast. In the "if you’re going to do it, do it right" category, she supplied me with an honest-to-goodness ladies’ slalom ski for this adventure… the first time I’ve ever used a water ski specifically designed for someone like me. Every idiot knows that there are differences between men and women; smaller feet (usually), lighter weight (usually), lower center of gravity, etc. I’ll admit that, slipping into the water, it occurred to me that I’ve only water skied about once in the last ten years, though it used to be a several times per week activity for me. I was sure that I hadn’t forgotten how, but not at all sure that I still have the strength and poise to pull up on the first try. Dang, that’s the boat to ski behind! With the rope tethered about 6′ off the water in the center, there’s no difference in crossing the wake from one side or the other, as was always an issue in my ancient little tri-hull craft. The beast of a motor will put out enough horsepower to go far faster than I was willing to try being as out of practice as I was, but I can still lean out and skim the fingers of my left hand across the water. 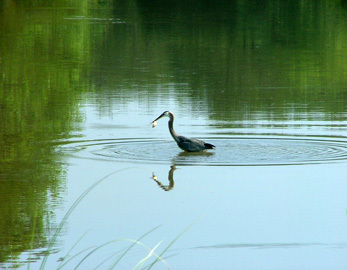 We also planted the idea with the nice folks at the Flatwater Grill that they should prepare for a brisk dockside to-go business; we were the first to have our order delivered to the water, and yum, it was tasty. Thanks, PunkHP and RealtorChick. I’ve never known luxury like that on the water. 9 comments Saturday 30 Jun 2007 | Netmom | Etc. 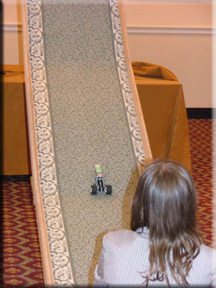 Delta raced her little car today — it went straight up the ramp, not touching either side, and made it all the way to the top. That alone puts her in an elite class of racers today. I don’t know whether she’ll place, but this IS nationals, and it’s her first year in TSA at all. That she completed four events is an accomplishment by itself. I hope that her enthusiasm is not diminished if she goes home without a trophy (which will likely be the case); I hope that I can convey the purpose of this event, which is experimentation and learning. However, the fact that she received several compliments from the judges lifted her spirits quite a bit. We learned this morning that they didn’t finalize in Cyberspace… and don’t know why. That’s one of the things this organization could do better — to provide some sort of feedback to the kids so they know what someone else did better, so they understand what to improve next time. Even the Transportation event (the little car pictured) isn’t judged on time trials alone; there’s also a notebook which constitutes 60% of the point value. In any case, it’s been both fun and educational. And, since this morning’s BEP Review Committee meeting was canceled (with no notice to us), at least I got to be here to watch the races. 9 comments Wednesday 27 Jun 2007 | Netmom | Etc. Most of the competitive events here at the TSA National Conference have a finalists process, given the huge number of students (about 4,500) involved. Generally, the finalists’ lists have been posted within a few hours of the event, so that students may arrange their schedules accordingly. For example, if a team makes the top 10 through judging of their display and notebook, they then go on to an interview process where the judges ask them questions about their entry. The event that I coach, Cyberspace Pursuits, is a web design challenge. The kids spent most of the school year building and perfecting a web page about their TSA chapter; the page was uploaded to the www and the URL e-mailed to the event coordinator about six weeks ago. It’s my understanding that the judging was supposed to take place two Saturdays ago… but something is wrong. The results aren’t posted yet… and they’re the only team that isn’t. Trouble is, the interview is scheduled for 11:30 today, but several of the kids have conflicts — two of the three on the team have conflicts beginning at noon. IF they make the finals, they would have to be there for the interview promptly at 11:30, skip lunch, and go on to their next events. At this point though, we have no idea whether there’s a conflict or not. I won’t even be here to shuttle them between events, as I’m taking advantage of being here in Nashville to attend a BEP Review Committee meeting today with one of our new City Council members, Charlie Hensley. It’s very nice to have City Council members interested in education issues, so I’m not going to pass up the opportunity to show him around. Keep your fingers crossed for these kids. There’s some serious competition around, but it would be nice to make the finals so they have the experience of the interview process. Most of my team are 6th and 7th graders, so they’ll have another opportunity next year… but we’re still hoping for the best. 0 comments Wednesday 27 Jun 2007 | Netmom | Etc. 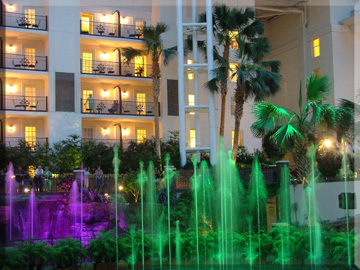 One of the many wonders of the Opryland Hotel is the "dancing waters" show in the "Delta" section of the hotel. I didn’t bring a tripod, but managed to capture a halfway decent shot by balancing my camera on the bricks. Today was a day to oversee the kids getting their exhibits set up, get everyone registered for the competition, and generally make sure all the last-minute details (like going out for duct tape) were managed. Tomorrow starts the convention and competition in earnest; after the opening session, little Delta has two written exams, 90 minutes each, back-to-back. She’s not worried in the least. Back home, it’s a relief to know that some of my favorite people are working on a new project — a fun one — that will give the online community in the Atomic City a new gathering spot. It’s too early for detail, but suffice it to say that the days of our having only one market for the free exchange of ideas is nearly over. Meanwhile, I’m here watching the next generation of inventors and innovators show off their efforts. That’s pretty cool. 3 comments Sunday 24 Jun 2007 | Netmom | Etc. In addition to her learner’s permit and some golf accessories, Gamma got a cell phone for her 15th birthday last Sunday. With the freedom and privileges that come with age and responsibility, she’s out without parents or older siblings more often these days. She’d asked for an MP3 player for her birthday (having been told that she couldn’t have a cell phone until her 16th — a diversionary tactic on my part), so I splurged and got her one with the MP3 player built in. It uses a MicroSD flash card for song storage, which arrived via UPS today. Every day when she goes to the big municipal pool, I tell her to lock it in the lockers. I’ve made sure she has quarters. And she has, every day, except that after she called me about a quarter of six this afternoon, she just stuck it in her pool bag and jumped back in the water, one last time. When she came back, it was gone. She found the plastic belt clip two tables away, stuffed under a pile of trash. Her friends dialed the number over and over, wandering all around the pool to listen to it ring, but nothing. The thieves had left the pool by then — it only takes a minute. She had it for all of five days. Signal insurance from US Cellular is a notorious rip-off, so it wasn’t insured. She was warned on Sunday that I will not replace it if it’s lost, broken, or stolen… so it’s a good thing she starts her summer babysitting job next week. It’ll take her nearly three weeks to earn enough to replace it. That’s a helluva hard lesson — just about all of her summer’s earnings to replace a gift that she had for five days. Although yes, it was her fault for leaving it unsecured, I’m absolutely fed up with the thieving little illegitimates who’ve taken up residence (or visitation) in our fair town. One of these days, they’re going to steal from the wrong person at just the wrong time, and meet up with a Louisville Slugger (or worse). Yet another of my offspring have attained that Holy Grail Dixie Cup of teenagerdom: the official, state-sanctioned learner’s permit. A few months ago, we purchased the Tumormobile with the purpose of it being the car that Gamma will learn to drive, as well as the one that she will drive once attaining the official license next summer. Henceforth, it will be known as the Mousemobile, though it still bears the BlueBerryFarm URL on the back window — a tradition that will continue simply because I think Damama and Bisc are a couple of cool folks who raised some really good kids, so I don’t mind advertising for them. We’ll be beginning driving lessons this afternoon, so you might want to stay clear of the ORHS parking lot. I admit to having a bit of fun tormenting her on the way to Clinton, noting that she’d studied so little that she was bound to be the first of our family to flunk a driving test — written OR road. 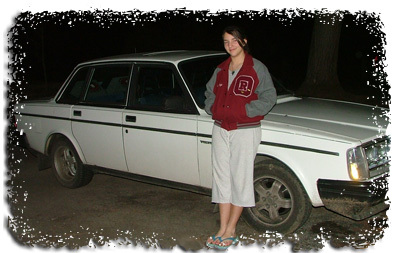 That said, her father does still hold the record in his hometown as being the only one to ever put the driver’s ed car on two wheels — WITH the instructor inside. I hope Gamma would never do such a thing. Okay, the Volvo must have the most forgiving clutch on earth. She only killed it twice — and both times not trying to start moving, but forgetting to clutch when stopping. We lapped the ORHS parking lot enough to wear some new grooves in the pavement, then made a left turn onto North Tulane, another left onto Providence Road (behind the high school), and parallel parked (okay, we were the only car, but still…) in front of the pool, where she got out and went on her merry way. Perhaps tonight, we’ll head out to Horizon Center to drive the wide, smooth vacant roads. Mike Nifong has been disbarred. A fit ending for a man who pandered to the worst of racial politics when he buried evidence of non-guilt in his quest to hang three white college boys in a town where there’s some feeling of resentment on the part of the minority townspeople toward the more affluent student population. It was political pandering at its worst. I’m glad he can’t do the same to anyone else. Trying to keep track of the best gas prices — within my normal driving range — has become challenging, but I found a neat tool to help in that quest: GasBuddy. There’s not a lot of monitoring in Oak Ridge yet, but two of the four stations that usually have the lowest price are on there. When I go out next, I’ll add Eddie Hair Firestone and the BP across from First Methodist. What Gas Stations Won’t Tell You (smartmoney.com) was an interesting read, too. I’d always wondered why two stations of the same brand within just a few miles of each other could have dramatically different pricing — the best example being the Weigel’s on the west end of the turnpike, and the Weigels on Hwy. 58 near the I-40 on-ramp: gas is nearly always 7-10 cents cheaper out by the interstate. Yet, the one in west Oak Ridge is said to be the highest-grossing Weigel’s in the Knoxville area. Lastly, there is no hard-and-fast rule about grade of gasoline and miles per gallon. On my old Mazda (the one that Alpha fatally overheated last summer), I got enough improvement in gas mileage with premium to save money any time regular gas was above $1.65/gallon (been a few years since I ran that test, obviously). In the Mustang though, there’s no appreciable difference in mileage between grades, and the owner’s manual says to use regular. So, know your vehicle, and save by using what works best for it.